Started bringing in the big houseplants yesterday. Rosemary was first. I think she's doubled in size. And next came the 41 yr old Jade, looking nice after her summer vacation. And the night blooming scylla , which has never bloomed for me. She has grown so much I didn't think she'd fit in her usual space, but a goodly amount of twine and various supports helped contain the sprawl. I've started shuffling succulents from pot to pot, and it's obvious that I'll be passing on many many aloe plants as there's just no where to put them, especially since we'll be moving my daughter's plants here as well. 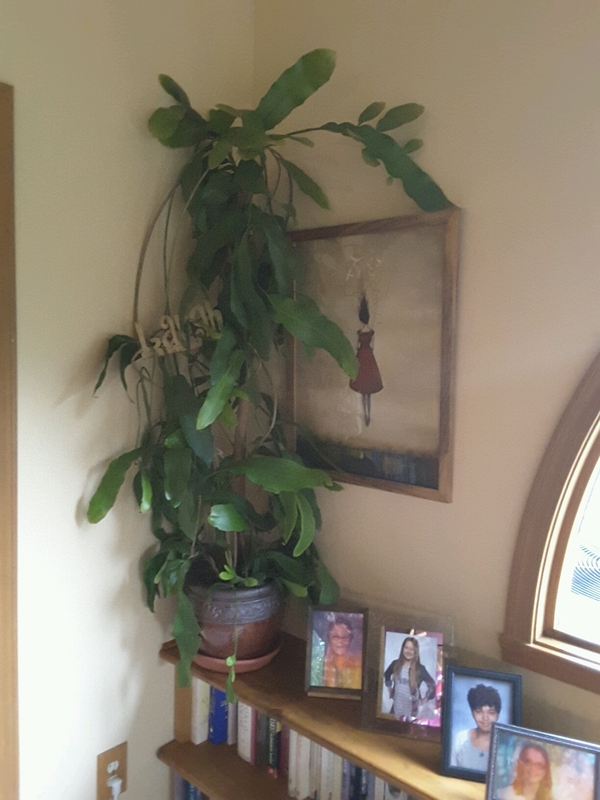 The summer was blessed with the perfect mix of sun and rain so the houseplants are healthy and huge. Looks like a nice day ahead so maybe some more repotting lies in my future for today. Quite grateful for Joe's help and the little dollie. Every year we wonder how much longer he'll be able to drag them in and out. So far it's still happening. Nothing like the look and smell of a rosemary plant! In my part of the world, there is still plenty of hot weather ahead. 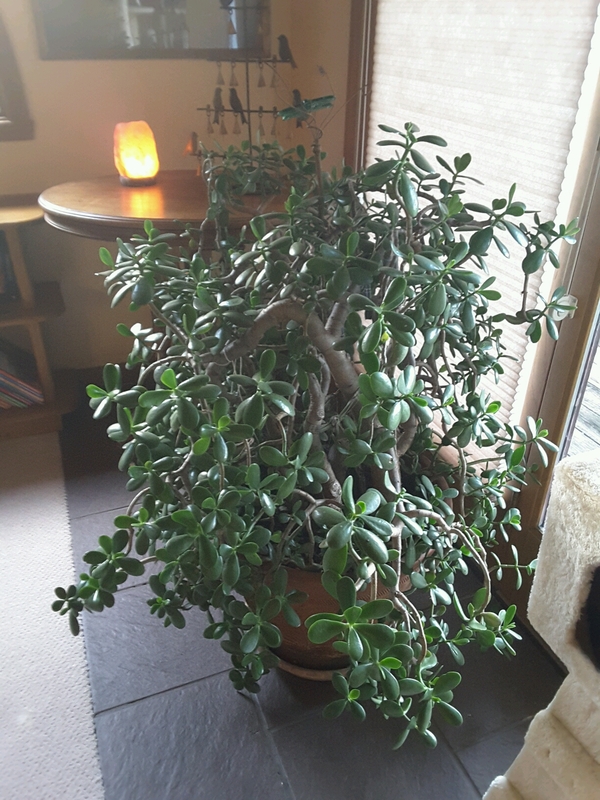 gorgeous, especially the Jade plant! how wonderful that it is so old! How long have you had it? Got it as a wedding present in 1975. You weren't kidding about bringing pots inside. I would be itching to bonsai that rosemary! In this part of California such tactics aren't necessary. Not that it doesn't freeze some years, but only once since I've been here (1988) has a freeze done major damage. (Now those trees are dead from the drought, which is far more devastating.) Typically if there's a freeze warning I'll throw a sheet over the cymbidiums; if I brought the plants inside, the black widows would come along, something I'd rather avoid. 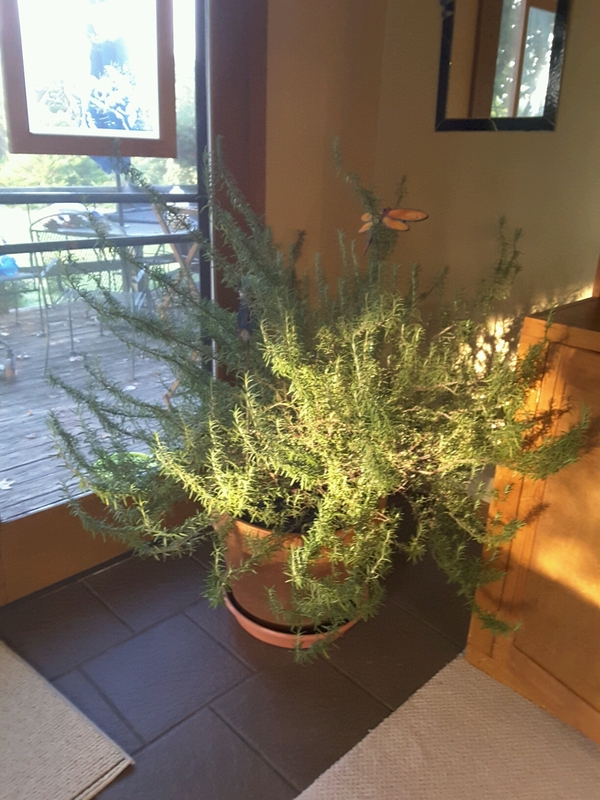 I have never brought my rosemary inside for the winter. Some years it survives outside and others it doesn't so I end up buying a new plant. I may just bring mine inside this year and see what happens. Yours looks fantastic! Gets below zero here most winters, so have never tried to leave one outside. I love seeing how big they get over the years, perfumes the whole room. A rosemary hedge, now thait would be awesome.